The theme for Challenge #105 is Anything Goes with Ribbon or Trim. We are also blog hopping today along with Heartfelt Creations. The entire RRR DT has been playing with some fantastic Heartfelt Creations goodies and they have some FABULOUS creations to share with you. We'd love to have you play along with our challenge and also hop along and see what else the girls created. We are showcasing one project from each below, but many of them have more goodies to share. Hop along starting with Ginny below and leave comments on each stop for a chance to win a $15 Gift Certificate to RRR. 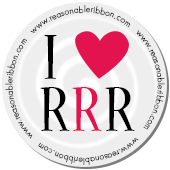 I will be selecting one random comment on one of the DT girls RRR/Heartfelt Creations Blog Hop posts between now and October 20th to Win a $15 Gift Certificate to RRR. Each link below will take you directly to the RRR/HC blog hop post. The Heartfelt Creations Design Team is also hopping today and featuring ribbon and trims from Really Reasonable Ribbon. Head on over to their blog and hop along to see their beautiful creations too. Here is a little inspiration from our design team for challenge #105 to get you started. All of the sample projects feature ribbon from Really Reasonable Ribbon and fantastic products from Heartfelt Creations. Now, let's see your Anything Goes creations! We will be selecting our top three favorite projects to feature, so stop back on November 5th to see our picks along with our next challenge theme. * Post your project on your blog or an online gallery (using code RRR105) and link it here with the Inlinkz tool below. Please provide a direct link to your post, not an entire blog. * You have until November 2nd at 11:59 PM Eastern time to enter your projects. Thanks so much for playing and good luck. Looking for another Anything Goes Themed Challenge? Head over and link up at Party Time Tuesdays Challenge Blog. Very cool hop- loved seeing every one's projects!!! WOW! These are all so wonderful! Wow!! Amazing creations!! Love Ginny's with the amazing flowers, colors.. just everything.. Just gorgeous!! Love that layout from Teresa!! Absolutely stunning!! Love everything.. Gorgeous!! Thanks for another fun challenge! Introducing the New RRR Design Team!! Happy Birthday Wishes to You!